1. Google picked a short, memorable name that’s fun to say and easy to spell: Yes, naming is marketing, and the name “Google” fits all the naming criteria spelled out in Marty Neumeier’s The Brand Gap and in the classic Trout & Reis tome Positioning. Who doesn’t enjoy saying “Google,” and how can you forget it? Compare that to “AltaVista,” which was my favorite search engine in the early Web. The problem: nobody could remember its name. Living in Southern California, we kept thinking “Loma Vista,” “Altadena,” “Buena Vista” or more likely “Hasta la vista” (in an Austrian accent). 4. Google related their technology to a personal benefit: Yes, Google is arguably better than other search engines, but repeat this three times: great technology alone does not guarantee success. Consider Sony’s Betamax, which was better than VHS, but suffered a humiliating collapse in the face of VHS’ superior distribution. Consequently, “Betamax” became a verb referring to great technology that’s been “Betamaxed” out of existence. Other companies with great technology but minimal market share include Subaru, Fujitsu and OKI Data — if only these engineer-driven Japanese companies would invest in some killer marketing! Google didn’t run around talking about their algorithms — after all, most Americans think an “algorithm” predicts emotional and physical cycles. Rather, in the minds of consumers, Google became the tool you use to find yourself, your friends and your ex on the Web. Nobody could resist trying Google out. Who hasn’t Googled an ex-boyfriend or ex-girlfriend? And these days, HR people and other hiring managers make it a point to Google job applicants. After that, Google became the default search engine for everything. 5. Google distributed their product everywhere: Google created a downloadable toolbar for your browser or desktop. You no longer had to go to their website to search. 6. Google promoted themselves as a cool company: They didn’t advertise their product, but they did run creative full-page recruiting ads. Unlike the competition’s boring recruiting ads, which rattled on about benefits alongside generic stock photos of grinning models posing as employees, Google’s ads featured tough brain teasers. How could any geek resist? I worked at a dotcom where everyone gathered around a lunch table trying to solve the teasers. You want to talk about brand engagement. 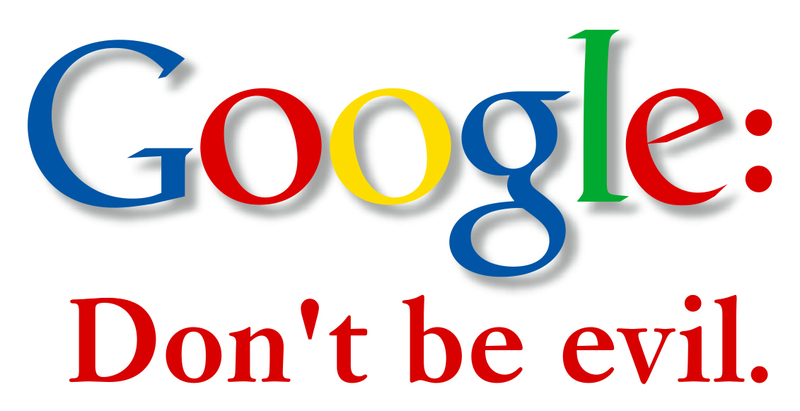 In addition, Google promoted its unofficial motto, “Don’t Be Evil,” which was memorable, fun to say and a far cry better than the corporate-speak that passes for most other vision and mission statements. As a result, Google invented more than a great tool; they invented a great brand. Hmm, with ads like that, maybe Google should stick to search engine marketing. Hahaha! Well written! My question: Where do these smug Silicon Valley execs go when their company goes belly up? Is there a way to track these guys to see how many companies they decimate? Thanks for the props, Marquis. And I agree: these execs should be tagged and tracked, just like national park rangers tag and track grizzlies. They usually wander from startup to startup, slaughtering original thinking at every stop. I think Google is a rare beast. Anyone that compares themselves to Google is BOLD to say the least. There are few companies that are as innovative as Google. It goes to show that while marketing is important, in some rare cases your product is so good and your company is so smart that everyone wants a piece of the action. Loved your post Freddy! As an Altavista user also, I remember how stunned I was with the simplicity and cleanness of Google the first time I visited it. As I matter of fact, I was wondering whether I got to the right address. Innovate…Innovate and then Innovate some more…Customers needs are changing really really fast and now the customer knows that a lot more is possible. For example need for consolidated information..I want to see weather, stock, calvin-hobbes…all in one page and Google replied by creating igoogle. They gave us a personal portal. I think Google’s core strength has been to innovate and add a new dimension to its portfolio of services pretty much every year. From search to mail to maps to igoogle…they have done it all and continue to drive innovation.